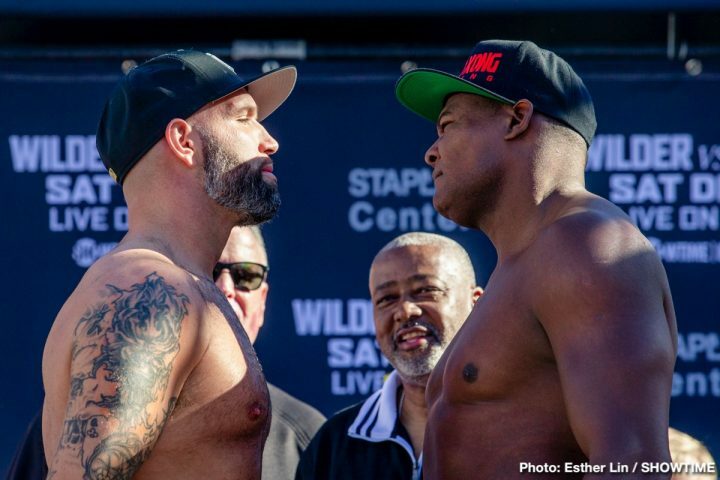 By Jim Dower: Luis ‘King Kong’ Ortiz (29-1, 24 KOs) has a nice showcase fight tonight against Travis Kauffman (32-2, 23 KOs) in a 10 round fight on the Deontay Wilder vs. Tyson Fury card on Showtime PPV beginning at 9pm ET/6pm PT at the Staples Center in Los Angeles, California. Ortiz, 39, will be giving away six years to the 33-year-old Kauffman tonight, but the age won’t be a factor in this fight. Ortiz is levels above Kauffman in the talent department, and he’s going to make a point of showing that when he gets him inside the ring. Ortiz looked in great shape on Friday at the weigh-in. He came in at 241 lbs compared to Kauffman’s 229 bs. Despite Kauffman being badly over-matched, he looked like he was trying his best to intimidate the Cuban talent during the face off. The two stood staring at each other for a long time without budging. The southpaw Ortiz seemed amused at Kauffman’s bravado if nothing else. He had the look of someone that had no worries at all about his fight with the American, which is understandable given the huge gulf in talent between the two fighters. Ortiz isn’t kidding when he says, ‘it’s not going to end well for Travis.’ Unless Ortiz has suddenly deteriorated from his recent 2nd round knockout win over Razcan Cojanu, he should make easy work of Kauffman. Ortiz has been looking really good as of late. He almost knocked out World Boxing Council champion Wilder in their fight last March in New York. Ortiz had Wilder on he verge of being stopped in the 7th round after hurting him with a left to the head. The referee gave Wilder a huge break in not stopping the fight during that round, as some referees would have stopped the contest due to how hurt the ‘Bronze Bomber’ was in the 7th. The New York Commission’s decision to delay the start of the 8th round may have cost Ortiz the win. Wilder staggered out of his corner at the start of the 8th, and the New York Commission spent approximately 20 seconds examining Wilder before they finally let the round start. By the time the 8th round started, Wilder had recovered and he was able to make it through the 8th without getting clipped again. Ortiz is going to be going after Kauffman from the opening bell looking to knock him out for his boxing fans. Ortiz wants to look good so that he can get another world title shot against Wilder or get a title shot against Anthony Joshua. To make that happen, Ortiz needs to smash fighters like Kauffman. The fight cannot be competitive. Kauffman comes into the fight tonight with a victory over Scott Alexander in his last fight. Before that fight, Kauffman was beaten by Amir Mansour by a 12 round decision. Kauffman had problems with Mansour’s punching power in that fight. He kept getting nailed by huge shots from Mansour, and the judges were more impressed with the big shots that Amir landed. Anyway you want to cut it, Ortiz is the better man in this contest. Kauffman has the youth on his side, but that’s not going to be enough for him to win. Ortiz is going to be dangerous in the first eight rounds. If Kauffman is still around after the 8th, he might have a chance of scoring a knockout if he can get to Ortiz’s chin in the championship rounds. Although Kauffman can take a good shot, he’s going to be getting hammered in the early rounds by Ortiz, and it’s going to be too much for him. Ortiz will get to Kauffman’s chin and score a knockout in the first three rounds. If Kauffman is smart, he’ll get on his bike and try and avoid the power shots from Ortiz in the first quarter of the fight. That’s easier said than done. Ortiz is relentless with his pressure, and he’s capable of using a variety of styles to get to fighters that are in the defense mode. At times, Ortiz can look like Muhammad Ali, Larry Holmes and Lennox Lewis. Ortiz able to switch styles at the drop of the hat. Ortiz has so much boxing knowledge. His ability to adapt to the changing situations inside the ring is going to make it difficult for Kauffman to do anything tonight to try and confuse the Cuban talent. It’s clear what Kauffman needs to do for him to have a chance of winning. He’s got to survive the first half of the fight, and try and take Ortiz into the later rounds the way Deontay Wilder did. It’s going to take a special performance from Kauffman to still be around in the last part of the fight. For Kauffman to still be standing by the 8th, he’ll need to have taken some major shots from Ortiz. If Kauffman can weather a furious storm from Ortiz the way that Wilder did in the 7th round earlier this year in their fight last March, then there’s a chance the Cuban will gas out and be vulnerable. Ortiz never got his second wind after he gassed out against Wilder in the 7th. The problem that Kauffman has in taking a lot of shots from Ortiz is he’s going to likely go down if he gets hit with a lot of punches. Either that or the referee will step in and halt the contest if it looks like Kauffman has turned into a punching bag for Ortiz.